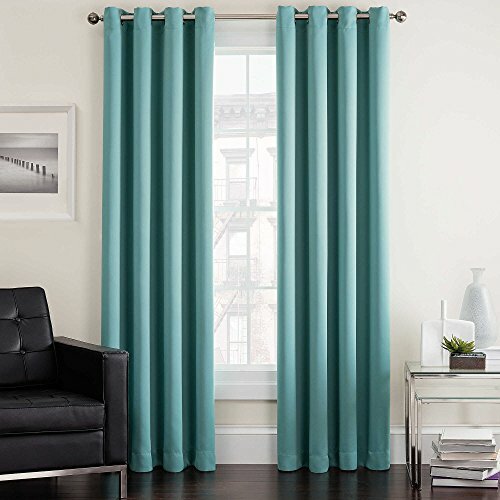 Enhance your home décor with the clean lines and polished look of the Twilight Grommet Window Curtain Panel. Made of durable polyester, this solid panel hangs on grommets and features clean lines and simple styling that will complement any room. If you have any questions about this product by Insola, contact us by completing and submitting the form below. If you are looking for a specif part number, please include it with your message. Bali Blinds Custom Light Filtering Cellular Shade with Cord Lift, 3/8" Double Cell Fabric, Double Cell Northern Lights Spa Blue, 52" x 48"
Bali Blinds 3/8" Custom Light Filtering Cellular Shade with Cord Lift, Spa Blue, 32" x 50"